Immerse yourself & dive into the culture of unforgettable Spain. The Spanish Spree trip is the perfect blend of culture & partying. See the Royal Palace in Madrid, the Alhambra in Granada & the Rock of Gibraltar, then cap off a fantastic holiday by watching the sun set over the Mediterranean on the beaches of Ibiza. Was $1729. Save upto $172. Do you wish to upgrade your package? Check-in to the hotel and head straight out into Madrid to get a feel for the city’s high energy life style. 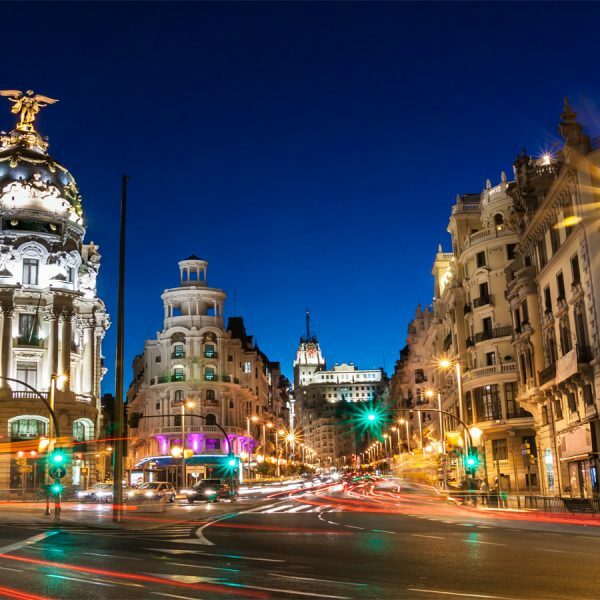 Moving to a whole lot of different beats, Madrid is packed with diverse barrios (neighbourhoods), lively plazas and a healthy nightlife. 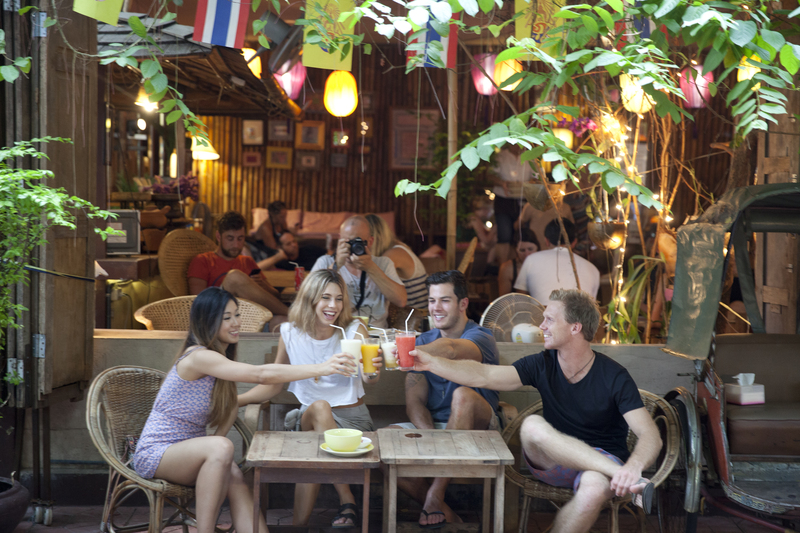 Later, meet up with the other Contiki travellers and your Trip Manager over dinner. 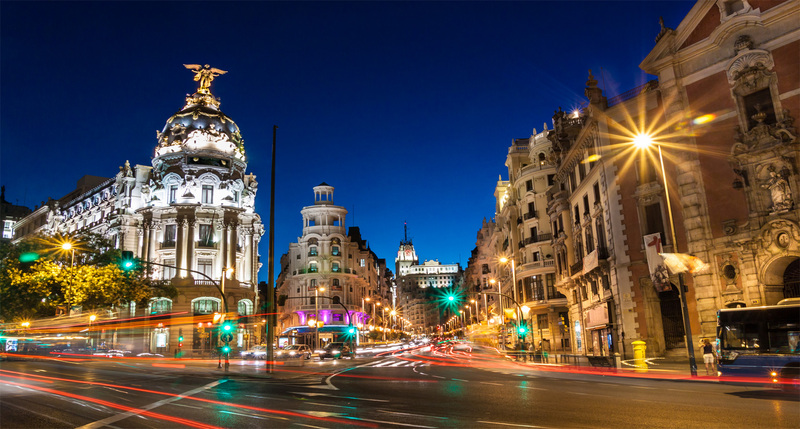 This morning, get inspired as your Local Guide opens up Madrid’s monumental heart with a look at its bustling centre, complete with the Gran Via, the Plaza de Espana and Puerta del Sol. Then, step into the largest palace in Europe with our Local Guide and experience a slice of the royal lifestyle as our expert shows you through the Royal Palace’s lavish rooms. If there’s a state function happening, we’ll head to the world-famous Prado Museum instead. In your free time, snack on the local favourite, churros (Spain’s version of the doughnut) or grab a chilled cerveza (beer) and put your feet up. There’s also a chance to explore the Valley of the Fallen where our Local Guide will tell you the story about the Spanish Dictator Franco and the Civil War. This city never sleeps, so get some pointers on the city’s hot spots. Head North to Bilbao, the Basque country’s busiest city. Stop by the pretty hillside town of Segovia, with its grand mansions and many squares. See the jaw-droppingly beautiful Roman Aqueduct, made up of 166 granite arches. This bridge is an impressive feat of ancient engineering. Onwards to Bilbao. An up-and-coming cultural hub, Bilbao is the down-to-earth home of one of the world’s most famous and iconic museums, the Museo Guggenheim. Use your free time to check out its amazing collection of 20th century art and keep a camera handy for the extraordinary architecture of the museum itself. Start the day off with free time in San Sebastian – beach resort and surf hot spot. 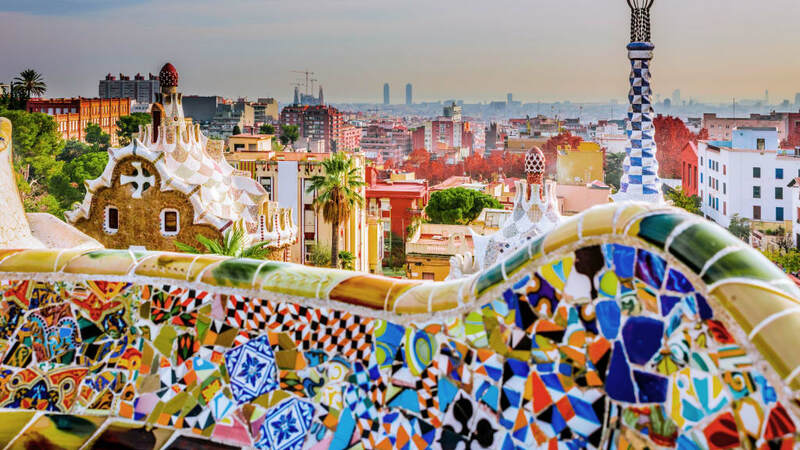 With one of the world’s most stunning urban beaches, a gorgeous Art Nouveau shopping district, loads of restaurants and the best pinxtos (bite-sized snacks on toothpicks) in Spain, you’ve got many ways to spend your time here. Later, pull into Pamplona, home to the extreme Running of the Bulls. Your Trip Manager will walk you along the route taken for the Running of the Bulls and show you the bullring, as well as the well-preserved old town and its incredible Gothic cathedral. Then take some time to explore Basque culture at the table by tasting regional specialties like barbecued lamb, fresh trout and red peppers. Chill out on the coach, plug in your headphones and watch the world go by. Heading to the coast, our next stop is the Baroque city of Zaragoza, set on the banks of the Rio Ebro. Check out the town’s fantastic cathedral, with its colourfully tiled cupolas and towers. Grab a table in the casco (old town), order a traditional Spanish churros for a snack and take in the unique, historic architecture and atmosphere. Next up is Barcelona. A sizzling, festive city any night of the week, Barcelona is all about action. First up: admire Montjuic. The hilltop has full-blown vistas of the city and it’s where we stop to check out the 1992 Olympic Games complex. Today there’s free time to discover more of Barcelona’s creative core. Pick up some quirky buys in the side streets or hit the big label shops on Gran Via or the Gothic Quarter. Take in all of Barcelona’s buzzing street life on the tree-lined La Rambla – a boulevard packed with street performers, artists, shops and stalls. Give an optional bike tour a go and get off the beaten track and onto Barcelona’s side streets with our Local Guide. 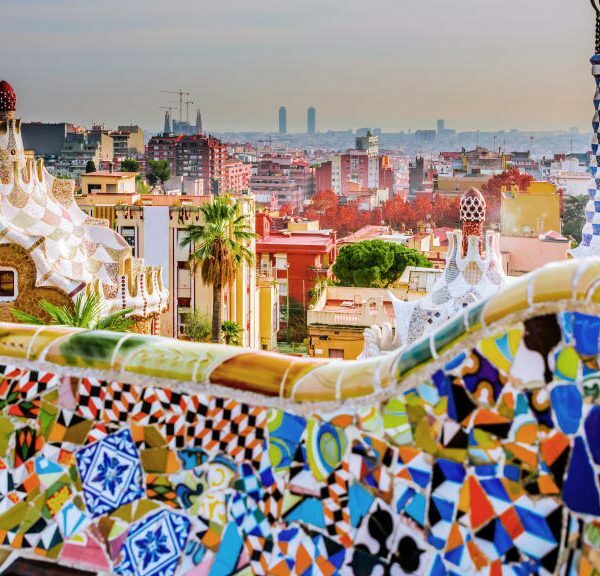 Other ideas for your afternoon off include hanging out in the colourful gardens of Parc Güell or kicking back with the locals on the beach and taking a swim in the Mediterranean sea. For lunch, there’s plenty of delicious local seafood to try as well as Spain’s signature dish, paella. Tonight get the low down on Barcelona’s hottest spots and maybe hit the pumping clubs of Port Olympico by the water. Jump on a plane to Ibiza, Spain’s party paradise. Dishing up a bit of everything, Ibiza is popular with sun worshipers, backpackers and those that want to party! Honour the birthplace of the rave by checking out Ibiza’s world famous clubs, which keep going until the sun comes up. Although this seems to be an island that never sleeps, you’re going to need to drag that head out of bed so you can see the incredible beauty of the place when drenched in daylight. Go snorkelling, explore Ibiza’s cute old town and it’s little souvenir shops, and watch the sun set on another perfect day. Ferry back to the main land and wind down on the coach as we head to Granada. Granada is crammed with romance and is filled with reminders of its North African heritage. With the famous palace fortress of Alhambra dominating the hills, the town is soaked in age-old atmosphere. Tonight, learn why Granada’s got such a reputation for amazing food. Try their fresh seafood, eat some more tapas (perfect for trying a bit of everything) and for dessert, the speciality Arab pastries are just right! Start the day at the palace fortress of Alhambra, this Moorish Palace is beautiful, with it’s intricate patterns and stunning architechture leaving you wondering why you haven’t been here sooner. To top it all off, it offers the best views in the city. The Muslim quarter of Albaicin and the Capilla Real are just some of the other ways your day today can be filled. Granada is also known for its incredible food – not least of all its Arab pastries – so you could also fill your whole day pleasuring your sense of taste. Pass the port cities of Marbella and Malaga. We stop in the unusual and quirky territory of Gibraltar, with its interesting mix of British culture, Spanish influence and some North African wildlife! Make sure you check out Gibraltar’s world-famous monkeys and learn about the legends surrounding how they got here all the way from Morocco. On a clear day, you’ll get views across the strait to the continent of Africa. Back on the road, unwind on the coach before our final stop in Seville. We spend the morning in the region’s stylish capital, Seville. It’s a fun, laid back city where the locals focus on the good life – siestas, late dinners, long lunches and dancing. With a run down on Seville’s background, your Trip Manager will show you the flamboyant Plaza d’Espana, the world’s 3rd largest cathedral, and the UNESCO World Heritage site of the Alcazar, still used by the royal family. In your free time, you could visit Christopher Columbus’ tomb, or check out one of the oldest bullrings in Spain. For something different, head to El Jueves street market and pick out some bargains. We keep travelling into the heart of rural Andalusia, through to Cordoba. It’s soaked in history and serves up an old-world atmosphere, with little patios, time-worn lanes and flower-filled balconies. Your Trip Manager kick starts your experience of the city by taking the group to the Mezquita (Mosque of the Caliphs). This famous site combines Islamic and Roman Catholic structures in a stunning series of buildings, complete with an orange tree garden and courtyards. Then there’s free time to wander around Cordoba’s historic centre and to take in its famously beautiful streets, like the Calle de Flores (Street of Flowers). Otherwise, learn about Spain’s checkered past with a visit to the 13th century Alcazar fortress, the former hub of the Spanish Inquisition. Hit the road and travel to the hill-top town of Toledo. With its mix of mosques, churches and medieval buildings, this gorgeous town is known as the “Imperial City” and is also a UNESCO World Heritage Site. You’ll see Toledo’s enormous Gothic cathedral, El Greco’s house and the site of sieges, revolutions and treason: the Alcazar fortress. Then it’s back in to the Spanish capital. Make your last night on tour one to remember and head out with the group for an optional traditional Spanish tapas dinner (a feast of plate-sized nibbles) in the heart of the city, right on the famous Plaza Mayor. Your trip ends after breakfast and it’s time to say farewell to your new friends. We're sorry. Tickets are sold out. Leave your details below to know tickets availability.